2 2 organizations intend to make significant changes to their system in the next two years. Five years ago, the same percentage of organizations (41 percent) expressed their intent to make changes. Performance reviews are occurring more frequently not just once a year. In 1997, 78 percent of organizations conducted yearly performance reviews. Today, 58 percent have a yearly review, while 41 percent perform reviews more often than once a year. By having more than one performance review each year, employees can better gauge their progress toward goals. They benefit from more frequent feedback, and the review process provides them with a more formalized assessment of their performance. Few organizations (20 percent) use online or software-based performance management systems, but many plan to introduce them. Online or software-based performance management systems are a relatively new development. Few organizations in our sample (20 percent) use these delivery formats, but more than one-third plan to move in that direction. An equal number of organizations are undecided about making the transition. For the majority of e-system users, web-based or online delivery is the preferred approach. In most cases (59 percent), users of web-based systems rely on performance management software that is independent of any other existing system. Most organizations (68 percent) discuss compensation apart from the performance review meeting. Discussing compensation during the performance review might have an impact on the quality and focus of the review. Organizations recognize that performance reviews are much more than just compensation reviews. Most organizations in our sample (68 percent) discuss compensation at some time other than during the performance review meeting. 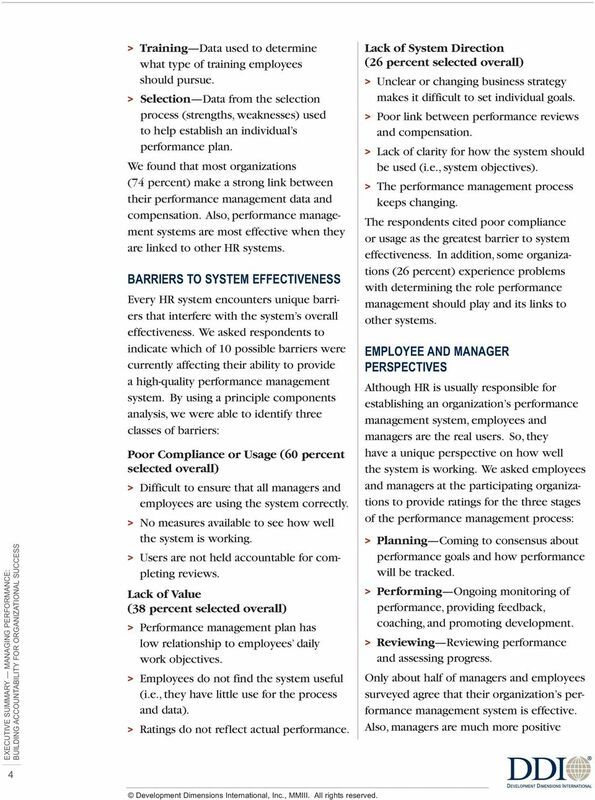 CURRENT AND PAST PRACTICES Respondents used a 6-point scale to rate how frequently their employees used 15 performance management practices. Included in this list were many conventional practices as well as more progressive approaches that reflect the changing role of performance management. 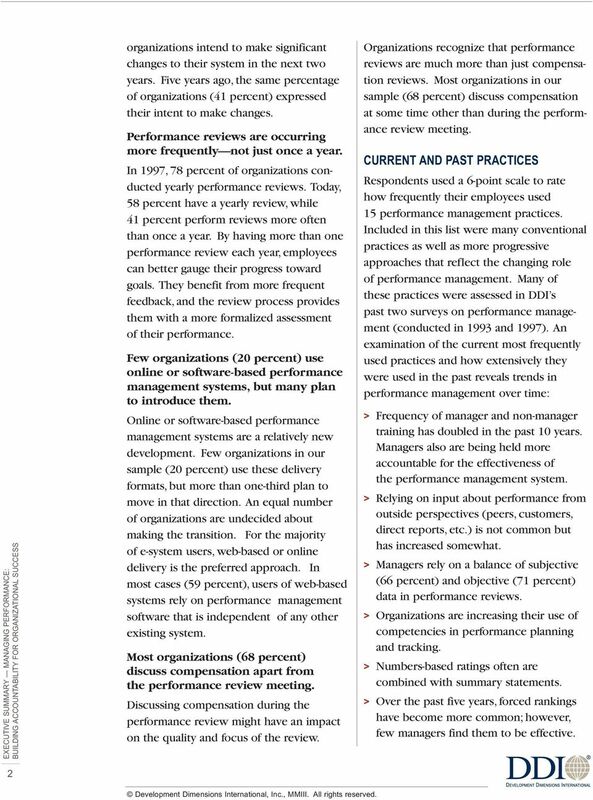 Many of these practices were assessed in DDI s past two surveys on performance management (conducted in 1993 and 1997). An examination of the current most frequently used practices and how extensively they were used in the past reveals trends in performance management over time: > Frequency of manager and non-manager training has doubled in the past 10 years. Managers also are being held more accountable for the effectiveness of the performance management system. > Relying on input about performance from outside perspectives (peers, customers, direct reports, etc.) is not common but has increased somewhat. > Managers rely on a balance of subjective (66 percent) and objective (71 percent) data in performance reviews. > Organizations are increasing their use of competencies in performance planning and tracking. > Numbers-based ratings often are combined with summary statements. > Over the past five years, forced rankings have become more common; however, few managers find them to be effective. 3 3 BEST QUALITIES AND PRACTICES We conducted an analysis to discover which qualities of a performance management system are most likely to predict overall system effectiveness from general qualities to specific practices. We used regression analysis to determine which qualities were the best predictors. Two analyses were conducted one for system qualities and one for specific practices. The most effective performance management systems are characterized by their consistent use throughout the organization, their integration with other systems, senior management involvement, employee involvement, and their links to organizational strategy. The first regression analysis revealed five qualities that uniquely predicted the effectiveness of a performance management system (in order of decreasing impact): 1. Consistency in use of the system across all managers (i.e., everyone uses the system the same way). 2. Integration of performance management with other systems in the organization (e.g., training, selection, compensation). 3. Involvement of senior management in driving the use of the performance management system. 4. Employee involvement in the performance management process. 5. 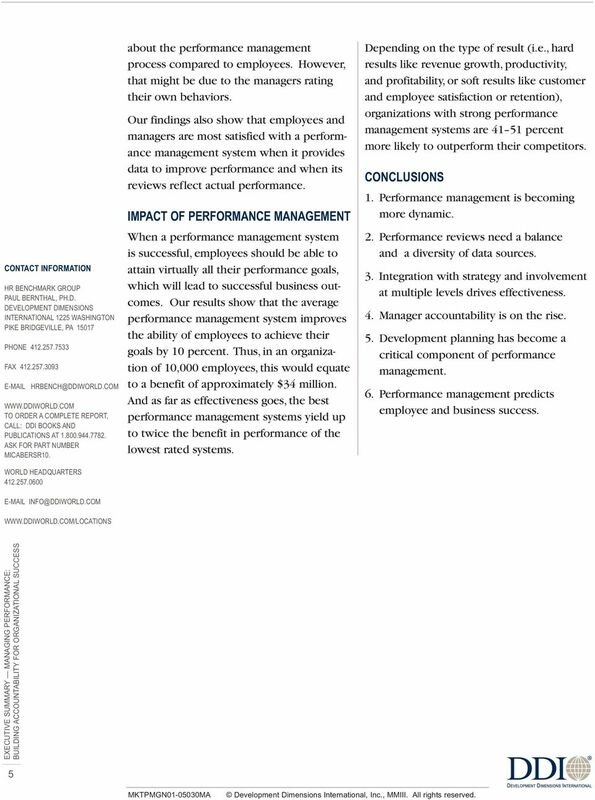 Value of performance management for driving the organization s strategic goals/vision. The most effective performance management practices include development planning, manager accountability, objective data, and competency guidelines. 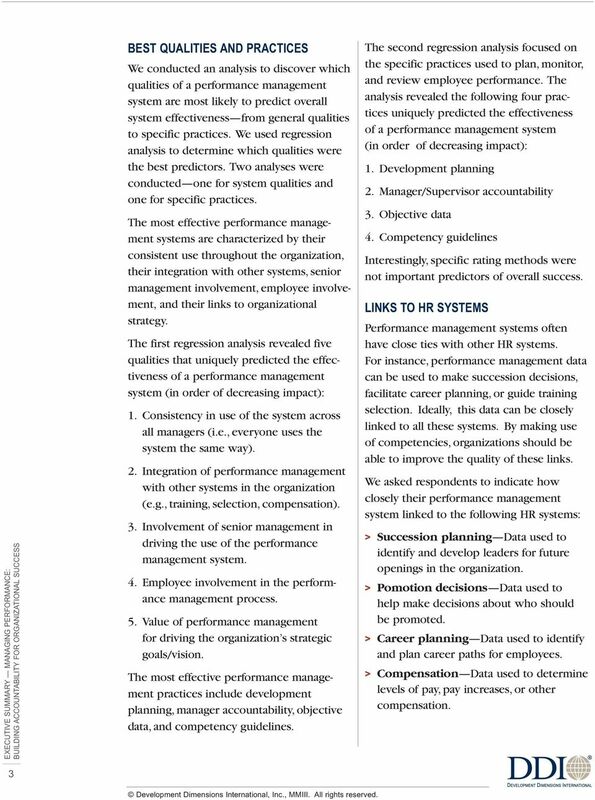 The second regression analysis focused on the specific practices used to plan, monitor, and review employee performance. The analysis revealed the following four practices uniquely predicted the effectiveness of a performance management system (in order of decreasing impact): 1. Development planning 2. Manager/Supervisor accountability 3. Objective data 4. Competency guidelines Interestingly, specific rating methods were not important predictors of overall success. LINKS TO HR SYSTEMS Performance management systems often have close ties with other HR systems. For instance, performance management data can be used to make succession decisions, facilitate career planning, or guide training selection. Ideally, this data can be closely linked to all these systems. By making use of competencies, organizations should be able to improve the quality of these links. We asked respondents to indicate how closely their performance management system linked to the following HR systems: > Succession planning Data used to identify and develop leaders for future openings in the organization. > Pomotion decisions Data used to help make decisions about who should be promoted. > Career planning Data used to identify and plan career paths for employees. > Compensation Data used to determine levels of pay, pay increases, or other compensation. Women Work: Global Leadership Forecast 2011 Jazmine Boatman, Ph. D., Rich Wellins, Ph. D., with Stephanie Neal, M.A. The Myths of Performance Management Strategies for Selecting and Implementing the Right Solution Dr. Katherine Jones Director and Principal Analyst, Bersin & Associates Copyright 2012 Bersin & Associates. Sales Compensation Management. Research Report Executive Summary. Improving the Impact of Pay and Incentives to Maximize Revenue. A Markets of One Approach to Employee Engagement By Kevin D. Wilde and Cheryl Bethune Over the last few years, consumer marketing has entered a new era of extreme customization and one-to-one marketing. A REPORT BY HARVARD BUSINESS REVIEW ANALYTIC SERVICES Frontline Managers: Are They Given the Leadership Tools to Succeed? A REPORT BY HARVARD BUSINESS REVIEW ANALYTIC SERVICES Frontline Managers: Are They Given the Leadership Tools to Succeed? Sponsored by Frontline Managers: Are They Given the Leadership Tools to Succeed? Productivity Transformation through Career Management Systems Don t we get it, it s their jobs By Lewis Hollweg, Ph.D. Benchmark Report. Customer Marketing: Sponsored By: 2014 Demand Metric Research Corporation. All Rights Reserved. 9 CRITICAL REASONS TO AUTOMATE PERFORMANCE MANAGEMENT Introduction As a human resources manager, you understand the importance of having a strong performance management process in place at your company. Performance & Talent Management SuccessFactors Integrated Applications Analytics and Reporting 6 5. How are my people doing relative to our goals? Drill down to see who is in on target and who is behind.. Global Talent Management and Rewards Study At a Glance Overview The 2014 Global Talent Management and Rewards Study provides an in-depth look at the practices and concerns of organizations around the globe. College of Employment Services Currently Available Courses: http://directcourseonline.com/employmentservices/core-curriculum/ The following is a list of courses available in the College of Employment Services. Copyright 2015 Human Capital Institute. All rights reserved. What past performance can tell us about the future. Stop Tying Pay to Performance Really? Succession Planning Tool Kit Succession planning is the process of identifying the key leadership positions within each department and developing employees within state government to assume these positions.